Israeli Ambassador to the U.N. Danny Danon presents outgoing U.N. Secretary General Ban Ki-moon with a 5 x 5 millimeter Bible mounted on a lapel pin • “Israel’s history, spirit and innovation come together in this tiny silicone-based chip,” Danon says. 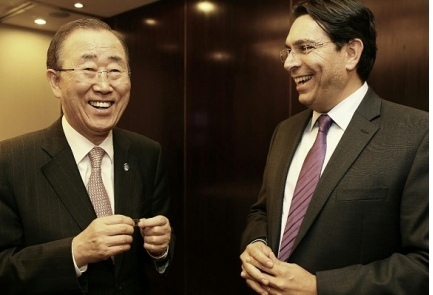 United Nations Secretary-General Ban Ki-moon, who visited Israel this week as part of a regional farewell tour, received the world’s tiniest printed Bible on Tuesday as a parting gift from Israeli Ambassador to the United Nations Danny Danon. The Jerusalem Nano Bible is the world’s smallest printed Bible, measuring less than 5 x 5 millimeters, and for the occasion was mounted on a lapel pin. 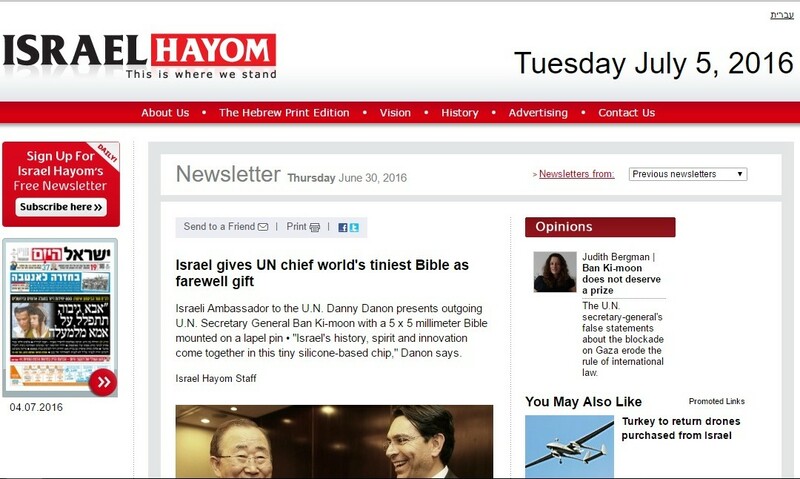 “The history, spirit, innovation and technology of Israel all come together in this one tiny silicone-based chip,” Danon told the outgoing U.N. chief, whose term in office will end on Dec. 31. “Jerusalem is mentioned 669 times in the Tanach [the Hebrew Bible]. Jerusalem and the Bible are why we are here,” Danon said. Ban immediately donned the lapel pin while the staff gathered to marvel at the tiny Bible. Ami Bentov, creator of the Jerusalem Nano Bible, said it was his goal to see that everyone who loves the Bible has access to this tiny version. “We have created it in a way that everyone who wants one can afford one,” Bentov said. The Nano Bible can be read only with a microscope that allows 10,000 times magnification.